The prevalence of Vietnamese restaurants in Vancouver cannot be understated. In certain neighbourhoods, one could find Pho every couple of blocks. This is especially true on the East side. The same cannot be said about the West side or in many of the suburbs not including Surrey and Richmond. 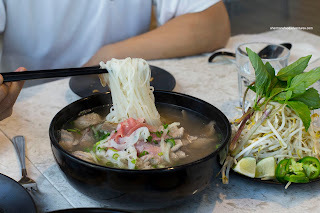 In fact, there are certain spots where it is a complete black hole when it comes to Vietnamese food. That was the case around the Brentwood area in Burnaby until recently when Pho D'Lite opened up shop in the Whole Foods complex. 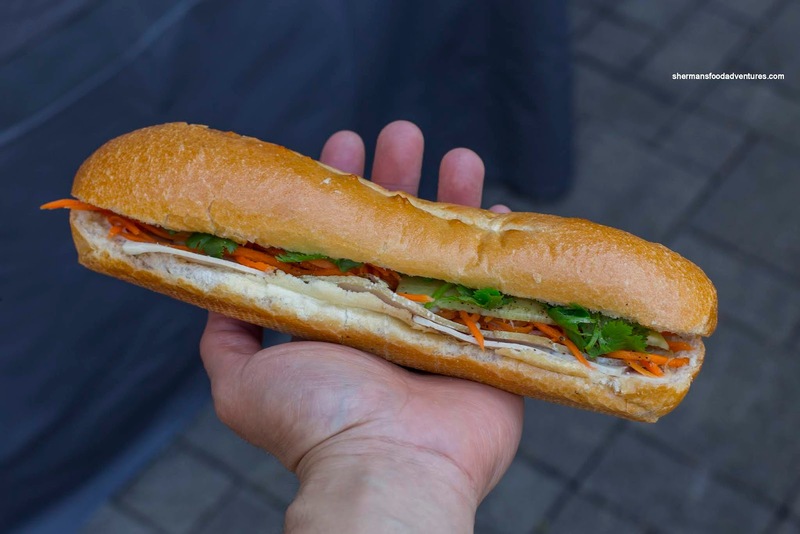 Now we have another player in The Viet Noodle Guy that also sports a separate Banh Mi shop upstairs. I originally checked out the place twice in the Summer and once more recently in December. This post is an amalgamation of the 3 visits. Originally, on my first visit, the portion sizes were plain ridiculous. A large bowl of Pho Dac Biet and Bun Bo Hue were almost too much food. Yes, I could barely finish my BBH while Kaiser Soze didn't finish his Pho. More recently, the sizes of both were more modest where there was less noodle (meats were almost the same). With all 3 visits, the pho broth ended up to be pretty consistent being clean and medium-depth. It wasn't salty and had enough inherent flavour for impact. The noodles and meat were on point each time. As for my BBH, I've had it 2 times and I prefer it over the pho. There was a briny spiciness that had plenty of impact and depth. 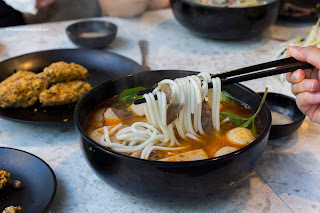 Although it lacked pork's blood and pork knuckle, the plethora of tender meats and slippery lai fun noodles made it fulfilling. 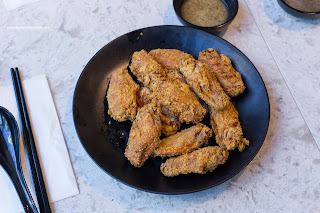 One of my favourite dishes at TVNG is their Fried Chicken Wings. If you were thinking Phnom Penh, you would be wrong. These were completely different, but good in their own way. Each mid-wing was juicy and well-brined while the medium-thick batter was crunchy with somewhat rendered skin. On the side, it was served with a lemon pepper dip akin to Phnom Penh but a bit more concentrated and thick. I've ordered these every time I've visited. 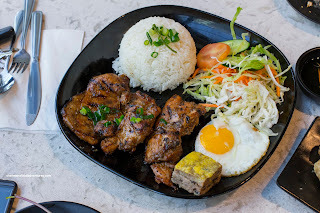 We've had the Lemongrass Chicken and Fried Egg with rice twice (the one in the picture has pork patty as well) and it has been solid. The well-charred chicken was juicy and well-marinated. The portion size for the rice dishes were more standard. It is a small detail, but the egg was fried just enough so the yolk was still runny. Some places totally obliterate this. As for their Banh Mi, you can eat in or get it for take out at their separate store upstairs. I found their bread to be decent being crunchy while riding the line between dense and airy. There was enough filling without being overloaded. Flavours were good except one time, the pickled daikon and carrot were a little weak. 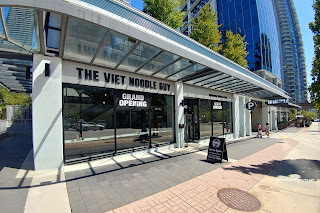 Overall, Viet Noodle Guy is a solid place to grab a meal. Portion size and quality are quite good while the prices are reasonable. I've found the service to be rather friendly too.